A puddle of acid water in the abandoned São Domingos mine in southern Portugal reflects the starlight from the Milky Way, the constellation Scorpius and the planet Saturn in this photo by astrophotographer Miguel Claro. Miguel Claro is a Lisbon, Portugal-based professional photographer, author and science communicator who creates spectacular images of the night sky. 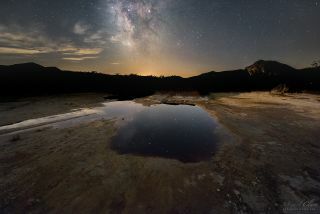 As a European Southern Observatory photo ambassador, a member of the international astrophotography project The World At Night and the official astrophotographer of the Dark Sky Alqueva Reserve, he specializes in astronomical "skyscapes" that connect Earth and the night sky. Join him here as he takes us through his photograph "Mina de São Domingos, an Open Hole to a Chemical Universe." In this stunning view of the São Domingos mine in southeast Portugal, starlight reflecting off an open pit looks like a portal to deep space. It seems like we could plunge through a puddle of acid water and into the constellation Scorpius. Overhead, Saturn shines brightly against the core of the Milky Way galaxy. Throughout history, the São Domingos mine has been a major source of gold, silver, copper and pyrite. Heavy elements present in these minerals were created by the stars billions of years ago, before the Earth or the solar system formed. Stars create elements through nuclear fusion, supernova explosions and even collisions. The areas of heaps, slag and channels of water give the landscape a "lunar" feel. The heaps are composed of different materials with high levels of metals, such as slag and ash, which leach through the rainwater and produce acid mine drainage, usually with an ocher or reddish color. The Milky Way shimmers over the São Domingos mine in southern Portugal in this photo by astrophotographer Miguel Claro. São Domingos Mine is located in Baixo Alentejo, about 240 kilometers (150 miles) from Lisbon, in the municipality of Mértola, which recently joined the Dark Sky Alqueva Route for the great quality of the night sky. The São Domingos mining area is part of the Iberian Pyrite Belt and is a source of basic metals (like zinc, lead, silver, gold and iron) and other elements, such as sulfur. It has been a sought-after place for the extraction of ores since antiquity, with evidence of gold, silver and copper mining in the pre-Roman and Roman times. The pyritic deposit of São Domingos (St. Dominic) was explored in various historical periods dating back to the first millennium B.C. (Eastern period) and the Roman Empire. After the Romans, mining at this site ceased until the 1850s, when various European mining companies began extracting copper, gold and silver. The mine closed in 1966, when the reserves were deemed exhausted.